WOODLAND HILLS, Calif., April 13, 2011 -- Employee volunteers from Northrop Grumman Corporation's (NYSE:NOC) Navigation Systems Division recently delivered quilts and pillows decorated with inspirational messages to children at Northridge Hospital. The outreach effort was coordinated through Soaringwords, a nonprofit organization dedicated to connecting ill children and their families to a community of compassionate and caring volunteers. "Helping hospitalized children feel supported and cared for by the community around them is what Soaringwords is all about," said Lisa Honig Buksbaum, CEO and founder of Soaringwords. 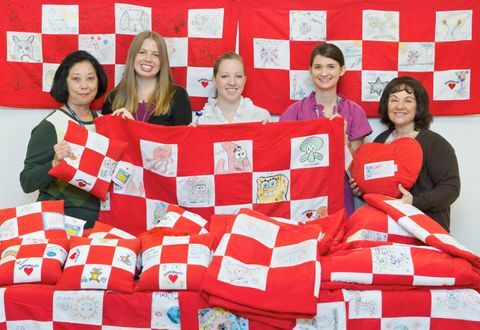 "Volunteers from local companies like Northrop Grumman help encourage the children to remain optimistic about their conditions, which is important to their healing." "Northrop Grumman values community outreach and continues to seek out new ways to support our neighbors," said Liz Iversen, sector vice president and general manager of Northrop Grumman's Navigation Systems Division. "Working with Soaringwords to show these children that we care has been inspirational for everyone involved."